Still stuck sorting through a large mass of historical items. Amongst the finds is this look by Soccer News at Richmond back in 1970. Then coach Wolfgang Smoger is the current President. Until three years ago Manfred Kuhn was Secretary, a role he performed for nearly as long as he was a gun striker. Sadly Mani's memory is starting to deteriorate, but he is still getting to games. I once asked him if he could list for me the years he won the Best and Fairest Award or Top Goalscorer title, but either because he had no record or was too modest, the list never came to fruition. The article has a solid history of the club, including the upheaval and split that occurred when the VSF was established. It also correctly captions a photo of the German side that won the Junior Laidlaw World Cup in 1958 that would later have the junior part omitted in subsequent club histories. 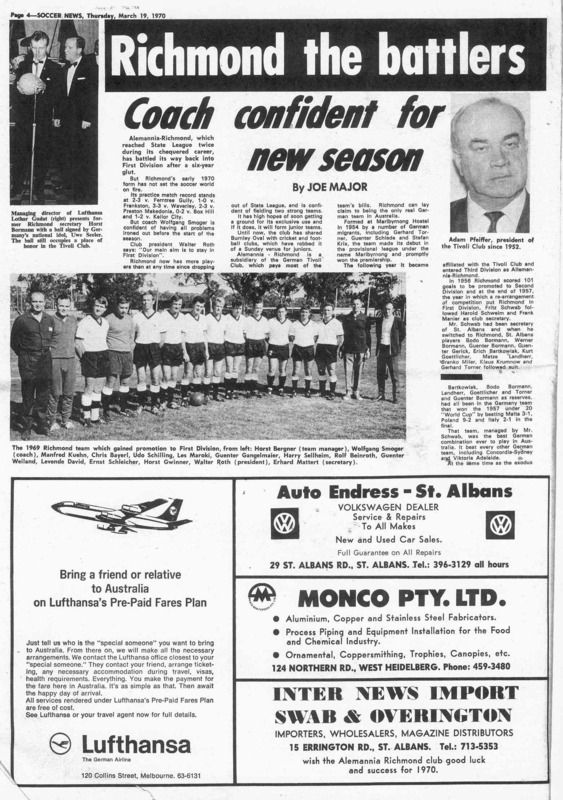 Fritz Schwab was the father of The Age and Soccer Action journalist Laurie, whilst I believe Franz Marth is the father of Melbourne Knights legend Andrew. The affiliation to the Club Tivoli would wane in the 1980's. Perhaps an opportunity was missed when the Club Tivoli moved from Richmond to Windsor when a move to acquire the Leonda By The Yarra reception centre was considered. 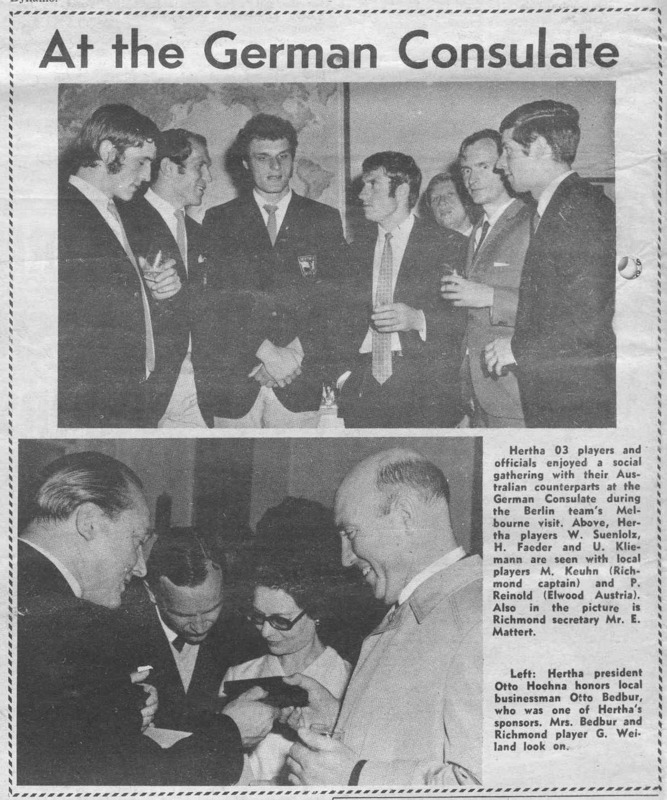 I've also included another item from Soccer News that year which shows Manfred Kuhn meeting with the touring Hertha Berlin players at the German Consulate. 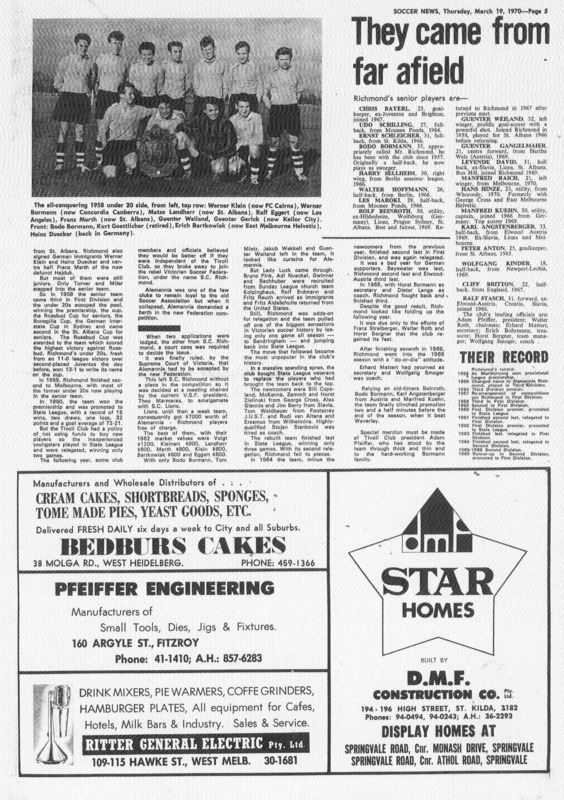 Hertha played a game against the Victorian state team at Olympic Park which ended in a 1-1 draw, the late Jimmy Mackay scoring for The Vics. Well, What Can You Say?